The chairman of beleaguered US investment bank, Bear Stearns, has sold his entire stake in the firm as a takeover by JP Morgan Chase looms. James Cayne received $61m (£31m) for his holding which at one stage was worth close to $1bn. Analysts say that Mr Cayne offloading all his shares is an indication that investors cannot expect a higher price for their stake. Bear Stearns is the most high-profile US victim of the credit crunch. It was forced to seek emergency funding from JP Morgan Chase and the Federal Reserve of New York on 14 March. News of Mr Cayne's move - revealed after Thursday trading - pushed Bear's share price down by about 5%. The firm had been at the centre of the US bad mortgage debt crisis which last summer sparked the global credit shortage, and there had been growing speculation that it was struggling to fund its daily business. Three days later JP Morgan Chase turned its rescue of Bear Stearns into a takeover bid, initially offering just $2 (£1) a share. At the start of this week, JP Morgan Chase increased its offer to $10 a share, following criticism that its initial bid was too low. 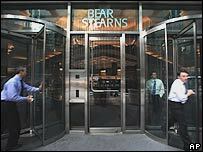 Some job cuts among Bear Stearns' 15,000 staff are expected when JP Morgan Chase completes its takeover.